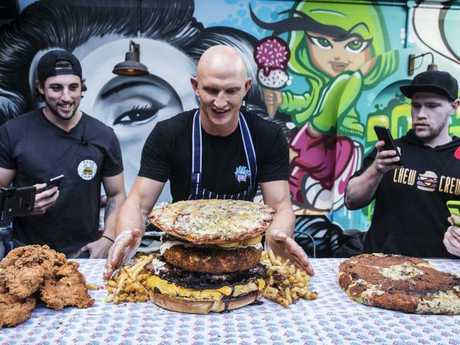 THREE professional eaters took just 39 minutes to eat their way through 16kg of food - including a 1.5kg Wagyu beef patty and a 6L milkshake - during a 'friendly' challenge in Sydney today. 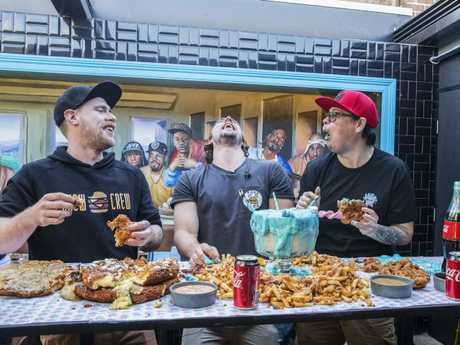 Cal 'HulkSmashFood' Stubbs, Isaac 'Sir-Eats-A-lot' Martin and Jesse 'Food Coma' Freeman devoured a feast of food at Milky Lane's 'Man Vs 16kg' challenge in Bondi this afternoon. 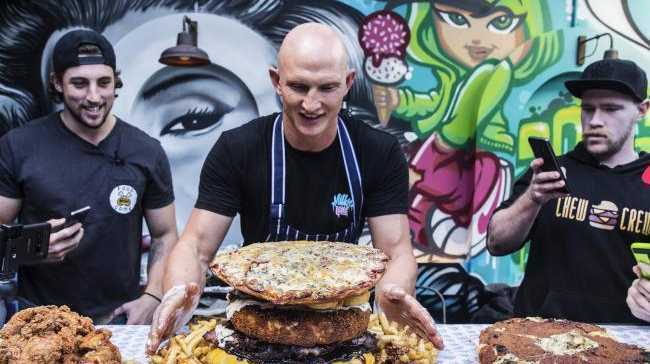 The competitive eaters had to smash 1.5kg Wagyu beef patty, 1kg of American cheese, 1.5kg deep fried brie wheel, 1kg bacon mac 'n' cheese, 1kg of smoky bacon and onion rings. 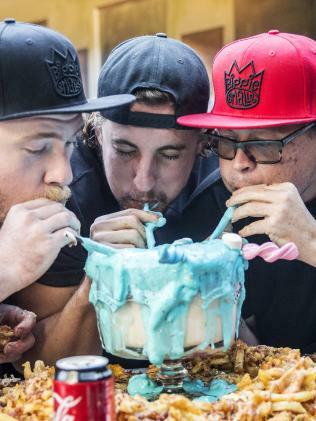 Contestants then downed a heavy platter of sides including fried chicken, a massive mac 'n' cheese doughnut and fries, before washing it down with a 6L mega milkshake. Mr Stubbs, Australia's number one professional eater and ranked 10th in the world, took the challenge in his stride. "I feel really great now, but it was a lot of cheese and protein to eat, and the milkshake made things a bit difficult," Mr Stubbs told The Sunday Telegraph. "But the food was delicious, we had a good crowd, it was a great day. "To prepare for such a big feed, we have a 'max out meal' 24 hours before. So you eat as much as you can, then you don't eat anything in the 24 hours before the competition. 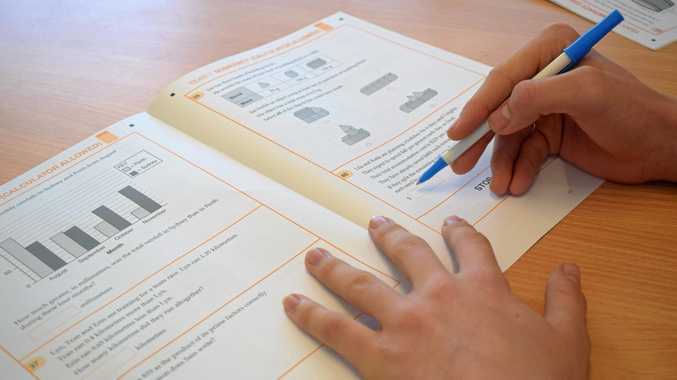 "Then in the lead up we drink a lot of water to stretch our stomachs." Mr Stubbs got a taste for professional eating three years ago through a local pub challenge. 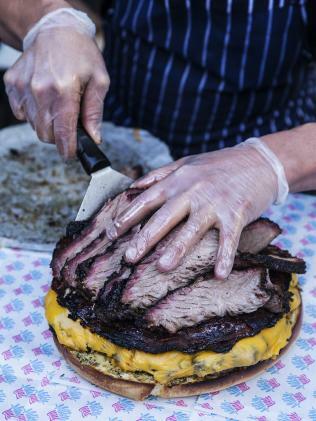 Since then, he has chomped up a whopping 259 eating competition victories in his career. "It's been amazing, professional eating has taken me around the world. It took me to seven countries last year, I've been on radio and television, it's my full-time job," Mr Stubbs said. He holds the record for eating the most cheesecake - gobbling up 5.3kg of the dessert in September, 2016. "Looking ahead, I'll be preparing for the Crown Casino Fourth of July competition and the Luna Park Hot Dog competition in July."